Here’s how to minimize the instances (and severity!) 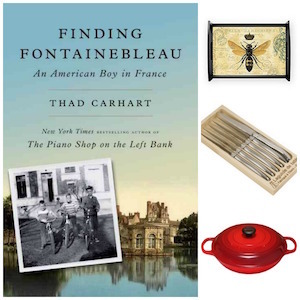 of hangovers via lessons learned in France. 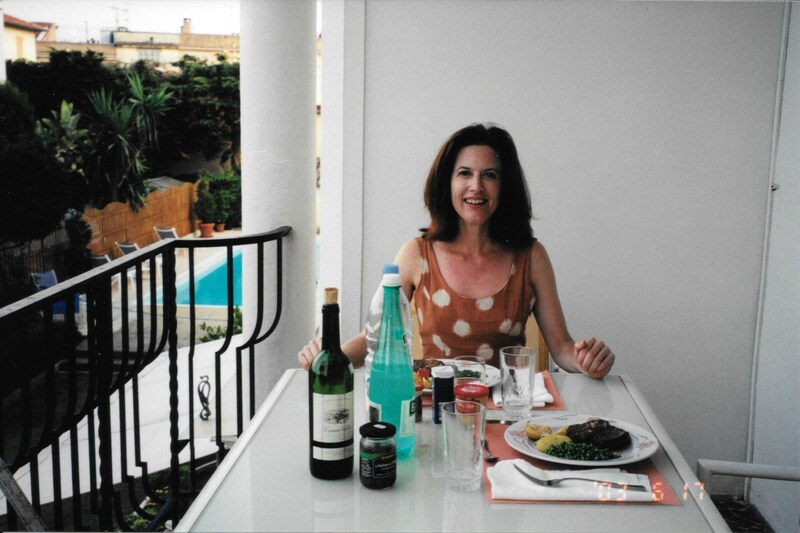 Me, on my vacation-studio balcony in St. Jean Cap Ferrat, with two of my three hangover prevention tactics. Yes–one of them is wine (but the right wine) Read on! I am very hangover-prone. Actually, I think this is a good thing, as it keeps me from over-serving myself. I consider myself a moderate drinker; at home, I rarely drink more than two glasses of wine a night. 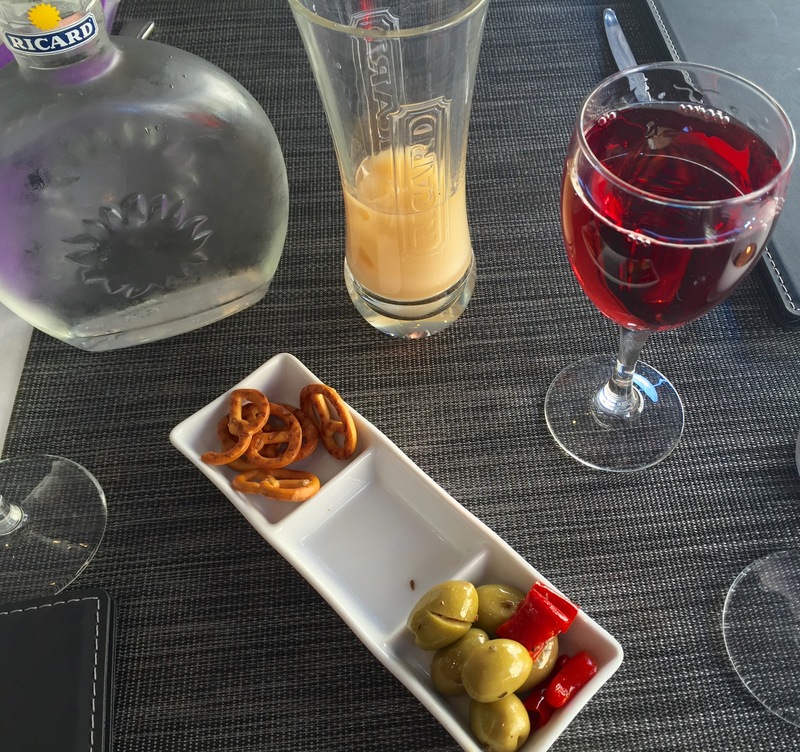 I start with an apéritif, and I have a small glass of wine with dinner. And then I’m done, because I know that that third glass will scalp me the next day. And yet, I just spent seven weeks in Ireland and France (mostly France), and only once did I get even a mild hangover, even though I very often went for that third glass of wine. Over the years, I’ve thought about what it is that makes me less hangover-prone in France, and, more important, what I can do in the US to reduce the possibilities of hangovers (besides of course, not drinking—not an option for this wine-loving epicurean). French wine currently in my home right now: All under 13% alcohol by volume; all priced under $15 a bottle. When it comes to hangover headaches from wine, many wine-drinkers point to the higher level of sulfites often used in American wines, claiming that the preservatives are the culprits. However, research on this is not conclusive. Can you eat dried fruits without getting a headache? Then sulfites are probably not the problem–as dried fruits are loaded with ’em. For me, boils down to alcohol content. Many American wines simply have a higher alcohol content (14 percent and more) than most French wines, which often weigh in at 13.5 percent or—usually—even lower. Yes, it matters: If you drink a 14.5 percent glass instead of a 12.5 percent glass, you’re getting about 13.8 percent more alcohol in each glass you drink. That adds up over a night. Let’s get one thing clear here. I’m not anti-lift in any way. I like (actually, I adore) that nice feeling of joy and well being that moderate drinking can bring. But I also like to sustain that light, pleasant lift over an evening, and not get stupid halfway into the first course. French wines let me do that (not get stupid, I mean). Takeaway? Drink French wine, and look at the label: Go for those with 13% alcohol or less. 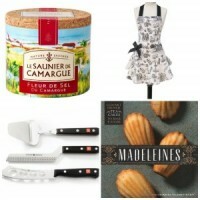 Happily, the timing for this is just right: These days, with the strong dollar, you can find good values from France. In fact, most of the French wines I buy these days are around $12 a bottle. The modest nibble with your drink. So common in France; so hard to find state-side. These days, I BYON (bring my own nuts) to bars that don’t serve snacks. I wrote elsewhere about the little snack that the French always serve with a drink, even at the most casual of cafés. Not only is it a gracious gesture, but it’s a smart one, too. Drinks on an empty stomach get you drunk. And hungover the next day. What? Serve drinks without a little snack? Well, that might happen in France…if you were dining chez a pack of badgers. 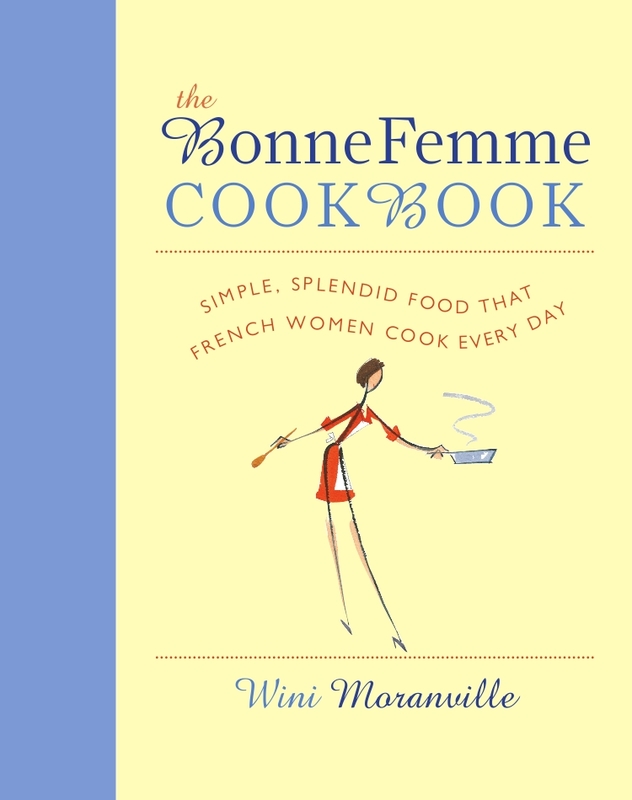 Hence, the little bowl of nuts or olives or snacks served alongside drinks in just about every café in every French town. For me, eating something when I drink has become such a ritual that I cannot do without. Back home in Amerique profonde, if I’m meeting friends for drinks at an American bar that doesn’t serve food (and wouldn’t think to bring a little nibble alongside your drink), I often bring a little bag of nuts along to furtively nibble on while I imbibe. I share, of course. In France, Mr. Eau and I always start the evening with an apéritif, either in our apartment or at a café. We have dinner with wine—but in moderation. Then, we take a walk; a nice long walk around wherever it is we’re staying. At home, I call my husband Mr. Sportcoat, but in France, he has another nickname: Mr. Eau. 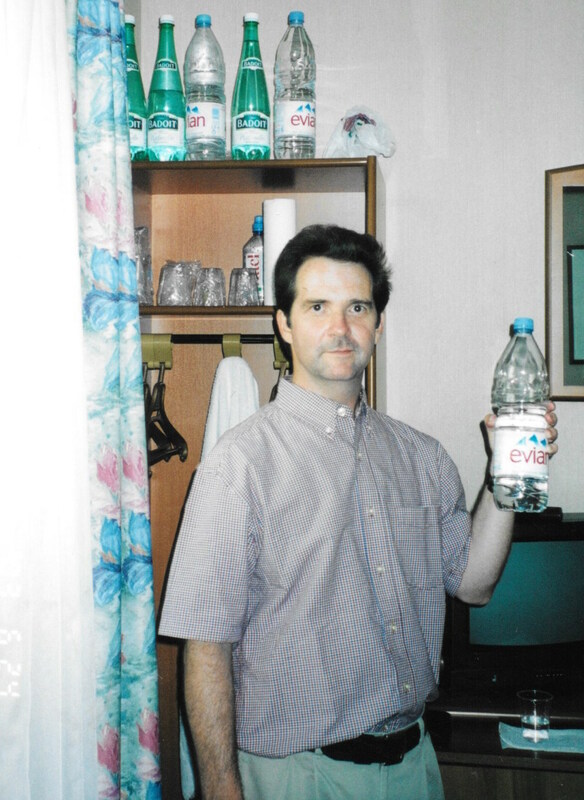 He adores French mineral waters, even more than I do. And then, it’s time for what we call “Café Eau.”* We are absolutely nuts about French mineral waters, and always have a huge array of them in our apartment or hotel room. We pull up a table and chair by the window (or in the garden or on the balcony) and polish off a liter of cool, wonderfully tasting mineral water as we chat into the night, recounting our day’s pleasures, annoyances, and discoveries. 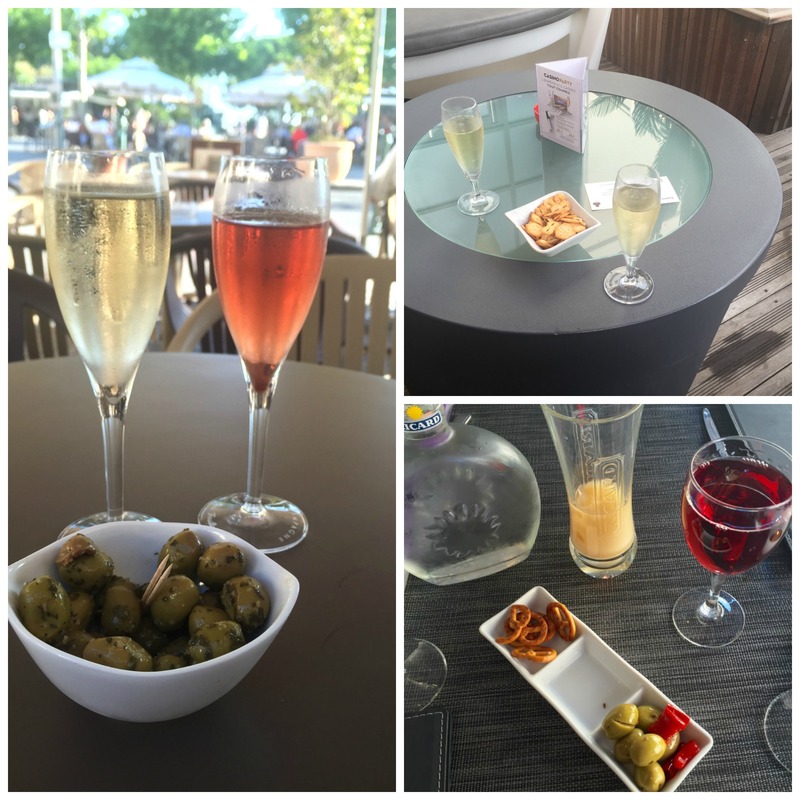 Café Eau is just as important (and enjoyable) to us as that pre-dinner apéritif. Some hotel, somewhere in France. 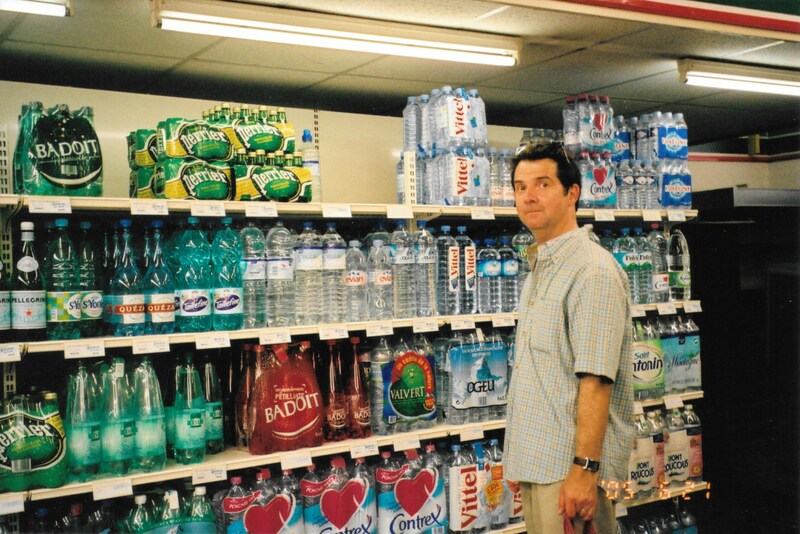 Mr. Eau and his supply of water. And it’s a piece of the puzzle that keeps me from getting a hangover. Not just any water will do. I think there’s something in mineral waters that truly do the body good–as in nutrients that get replenished. And they taste good. My favorite is Vittel, a very rain-on-wet-stone-tasting still water. 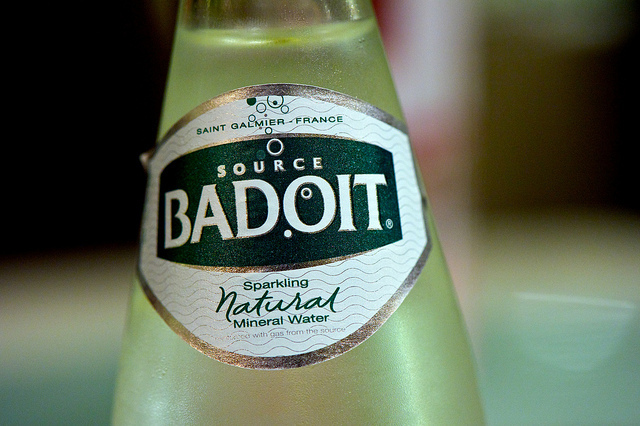 And I adore Badoit**, a very-lightly-fizzy, slightly bicarbonate-y sip that’s really refreshing and also makes you feel better after a heavy meal. 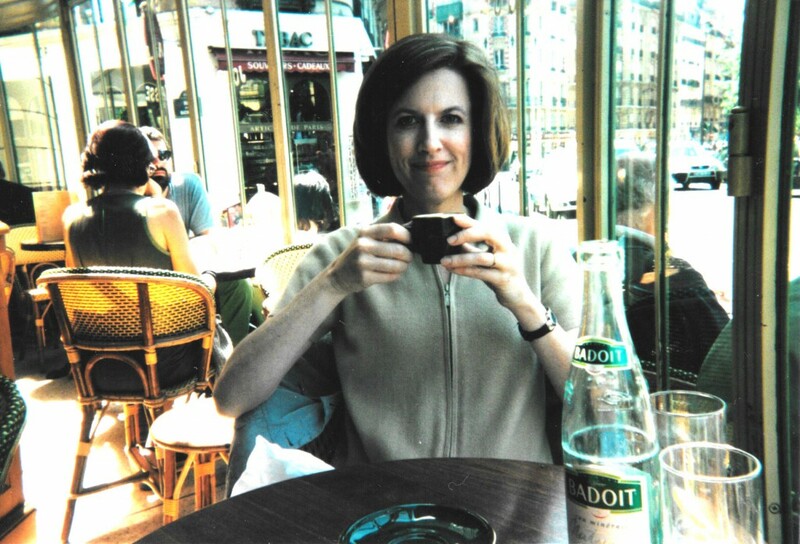 Mrs. Eau and her after-dinner bottle of Badoit. In short: It’s easy to drink more water when you love the taste of the water you drink. And the more water you drink, the better you’ll feel the next day. Forget San Pellegrino. Would somebody please start importing Badoit? Photo credit. Sadly, neither Badoit nor Vittel are available back in Amerique profonde, so I settle for the ubiquitous San Pelligrino (yawn) or Volvic (good, but dreadfully expensive at my local Whole Foods). We don’t have “Café Eau” every night at home, because we’re not exactly on vacation anymore and our days and evenings aren’t as leisurely. But I do keep lots of really good water around. And that, my friends, is how I generally avoid getting hangovers in Amerique profonde. So, I’m curious: Do you find you get fewer (or less severe) hangovers in France—and if so, what do you attribute that to? 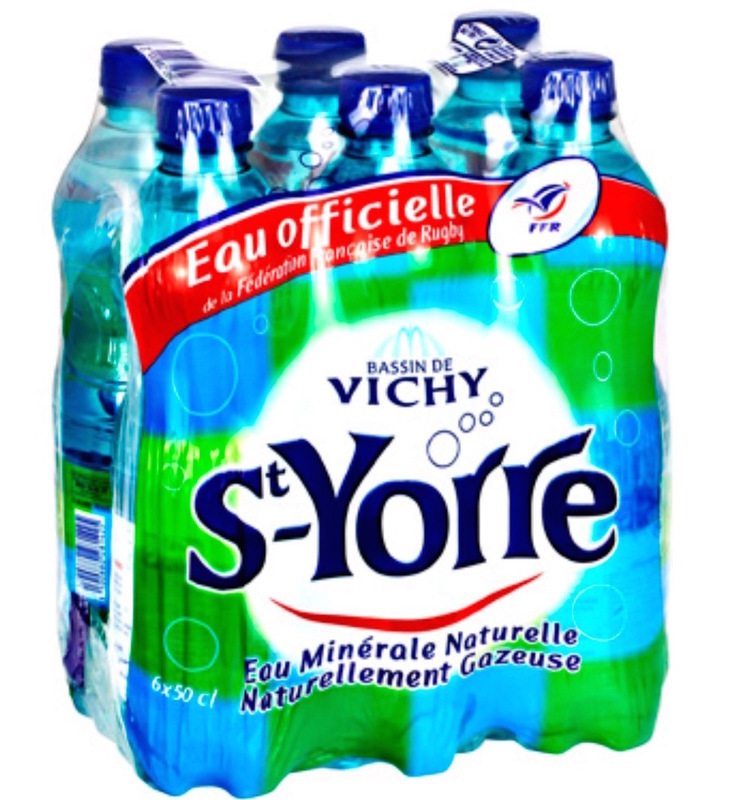 ** PS: A word to the wise: Select St. Yorre mineral water at your own peril. It’s refreshing and has a compellingly saline-y minerally flavor and wonderfully tummy-soothing qualities, but can also have, um, laxative effects. You’ve been warned. You’re welcome. I can’t believe all those kinds of waters. Are they really all that different? Oh yes–the Great Waters of France are more varied than I would have ever imagined. Hmmmm…..might be a fun idea for an upcoming post. Thanks for the idea. Great idea for a post–thanks! And thanks for the kind words. Great post. I wonder how we could get Badoit imported to the US. You should be their spokesperson! Yes. I’ll talk to Monsieur Badoit any time he wishes! I used to drink Pellegrino or Perrier in France and then started regularly buying it in the US. To me, the winner was a water with fizz. It seemed to quench my thirst and I liked drinking it with a meal with wine. Now in the US I use filtered tap water that I then carbonate from a tank under pressure to get a much cheaper and still satisfying fizzy water to drink. This actually encourages me to drink more water regularly. The most promising way to keep from getting too tipsy after a meal is walking. In France you walk from your restaurant in a leisurely way along new streets back to where you are staying. In the US we jump into the car. I believe of the three reasons you listed, this one is the healthiest and best way to clear your head before you go to sleep and avoid the morning after head ache. Always enjoy your articles and your recipes. Thank you. Ah the after-dinner walk. I miss it so much! Indeed, if there’s something lovely to do (like walk around a beautiful town), it’s so much easier not to order another glass of wine. Good idea about the water! 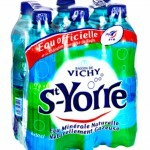 I saw/heard Wanda Sykes, the comedian talk about while in France she kept drinking large amounts of Vichy water. She said she was the only one that did not know that it had “that effect” on her. She was pretty upset that everyone knew but her…. and why did no one tell her. Is your husband French? He has extraordinary dark eyes. You look really cute at the bistro table. That’s so funny that Wanda Sykes has that experience. No, my husband is not French…but he does have those lovely dark eyes! Even finding French wines with alcohol levels at the 12.5% (or maybe 13%) level can be somewhat of a challenge here in the U.S. Happily, I’ve discovered that most wines from the Loire Valley and Beaujolais regions tend to come in that level and the wines are very food friendly (i.e. Cabernet Franc, Sauvignon Blanc and Gamay). Best of all, the pricing from those regions is also very reasonable. I almost forgot! Rieslings hover around that range also. And don’t just equate Riesling with Germany, the Alsace region of France also produces excellent Rieslings. You’ve mentioned some of my favorite wines! 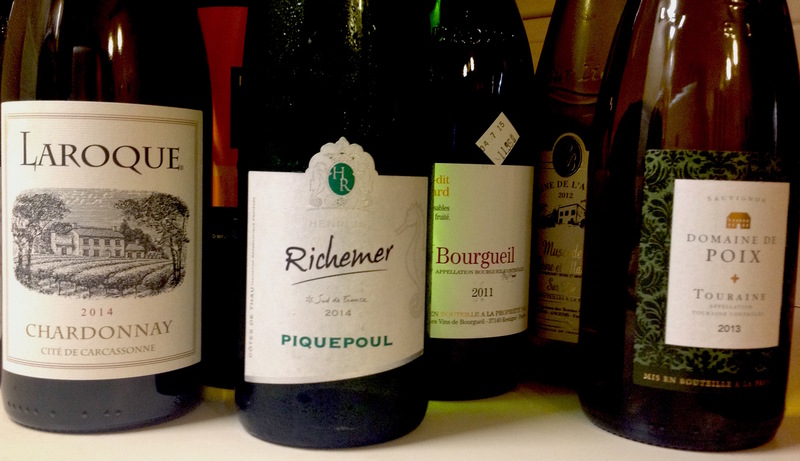 I love the Loire Valley reds (even though they’re more famous for their whites). And the Beaujolais cru are just so food-friendly. The prefect “bistro wine” at home. While Beaujolais cru can climb in price, I find plenty of Loire Valley reds for around $12 a bottle. Love Alsace Rieslings. I always say that I never understood Riesling until I went to Alsace! And you can’t beat the cremants, especially for the price! As for the alcohol content–you’re right; some can climb in alcohol range as well–I see lots of 14% and above, especially from the Rhone. While I love the flavor of a Gigondas, I can’t tolerate the alcohol (I drank one in France that was 14.5%, and that was partly the cause of my sole hangover there). One more thing – the sparkling wines (i.e. Cremant) from Alsace are also excellent and reasonably priced. I find red wines, from anywhere, give me a hangover more than white wines. Agree that eating while drinking is imperative for me to avoid a hangover…just nibbles like you said but hard to find US restaurants that do this. 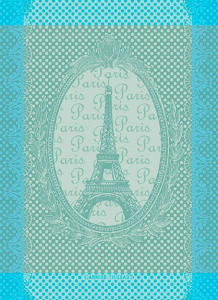 Enjoy your posts, Merci! My understanding from an article a while back, is that a hangover is a sign that the alcohol has dehydrated your body. So if true, it would make sense that the water at the end of the evening would remedy that condition and you feel fine the next morning. I always remember from my trip to Europe that many would add water to their wine during the course of the evening. Good point–and I have also been known to add a little water to my wine now and then. Often, in fact, I’ll put ice cubes in my white or rosé wines to cool them down (and slow me down). Thanks for this reminder.